Each year the pupils in the Senior Room take part in a project called 'The Work of Our Hands'. The idea behind the project is to give each pupil a chance to show their talents. The pupils make something, often with the help of a parent, grandparent, aunt or uncle and show their creation to the rest of the class. We also invite the parents and family members in to see the work. Below are some of the projects the children produced this year. 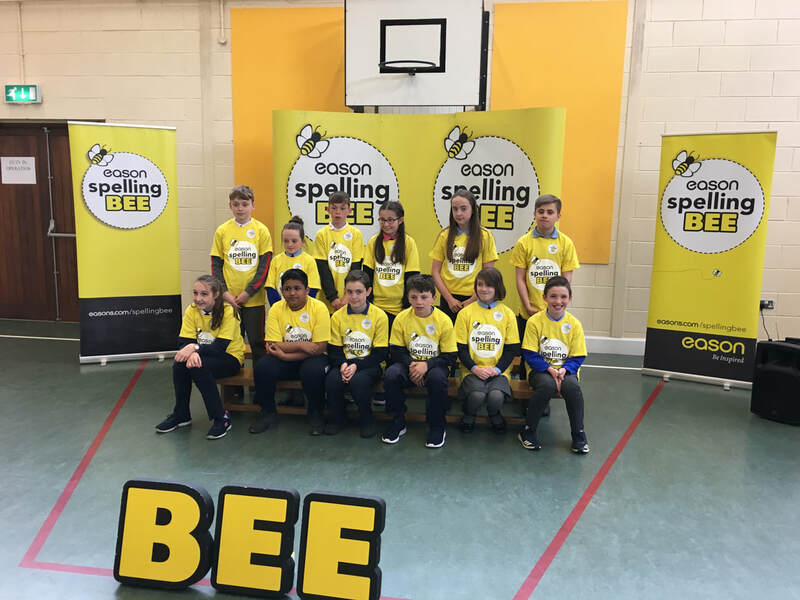 In March we had a Spelling Bee in our class. Each pupil had the opportunity to take part if they wanted. 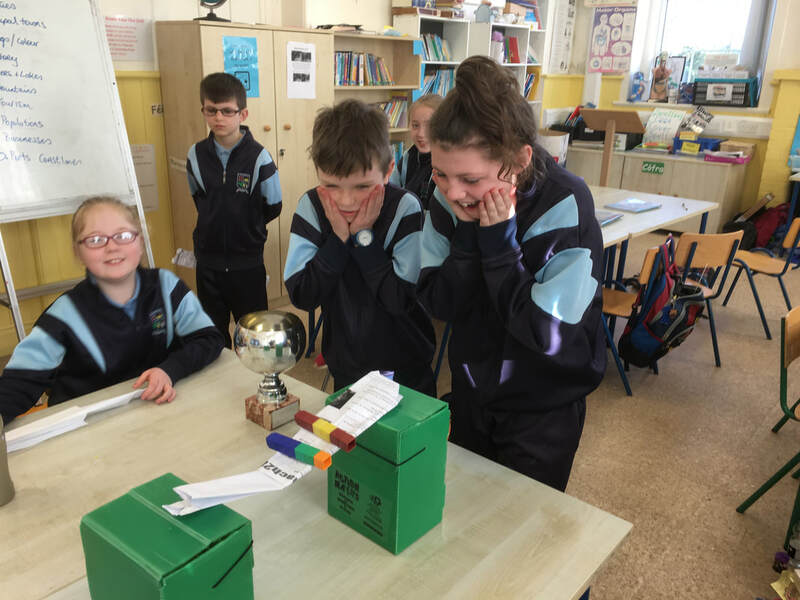 In the end, after a tough final, Conor was the winner and went on to represent our school in the Eason Spelling Bee in May. He did very well and made it through to the last rounds before being knocked out on a very tough spelling. 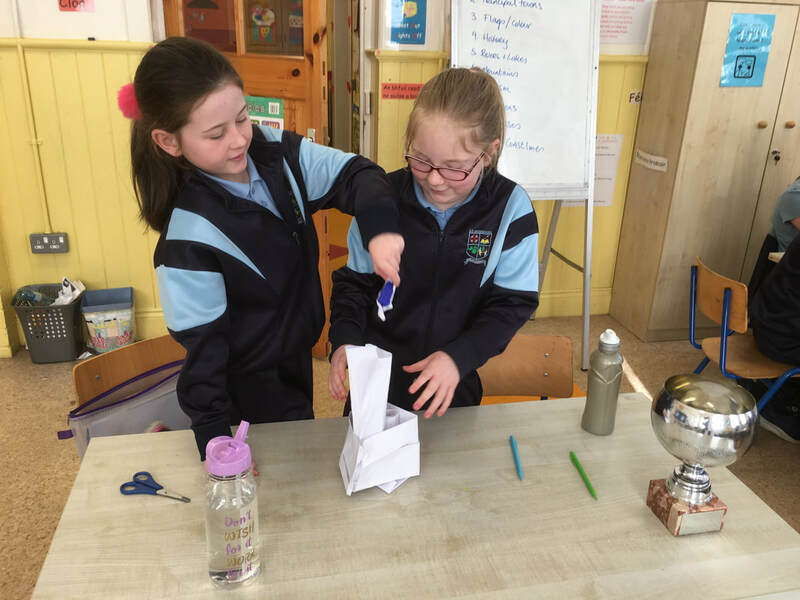 Congratulations to our two pupils who did so well in the recent Monaghan County Museum history competition. Each boy achieved 3rd place: one in the 3rd/4th class category and one in the 5th/6th class category. The director of the Museum and the Education and Outreach office both complimented the pupils on the very high standard of research and presentation. 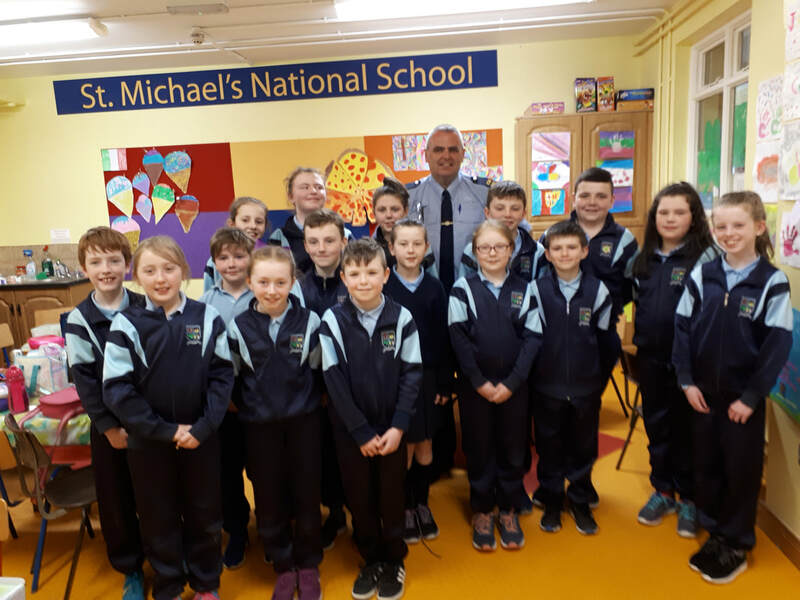 On Friday 20th April the pupils in the Senior room had a visit from Garda Paul. He was here to talk to the pupils about Internet Safety. Garda Paul gave them lots of good advice about not sharing information online and not accepting 'friend requests'. He reminded the pupils that a person has to be over 13 to have a Snapchat or Facebook account so no pupil in primary school should have either. He stayed with us over an hour and hopefully the pupils are better equipped to protect themselves online. 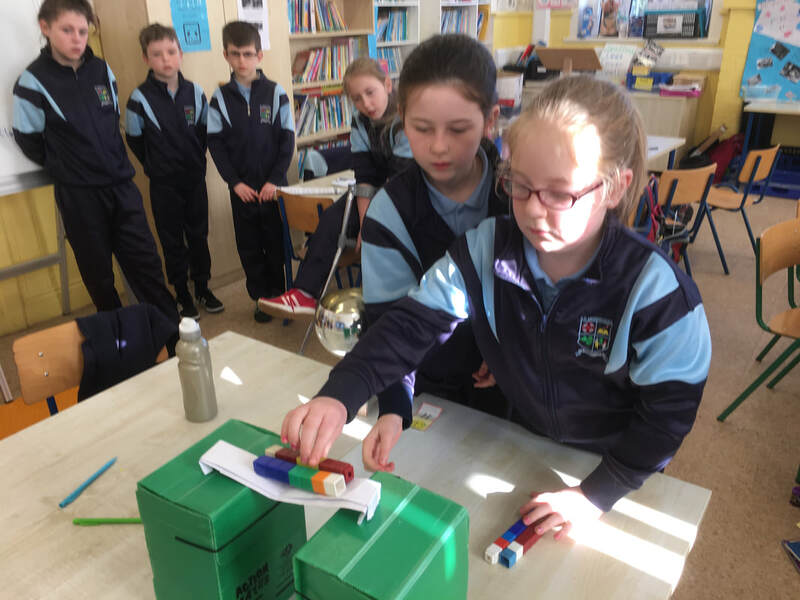 A HUGE 'Well Done' to our pupils who represented our school so well in Gortakeegan on Friday 13th of April. They played 4 games and won one game well. More importantly they all got to play and really enjoyed the experience. Special thanks to Francis' mum who arrived to cheer us on with ice-cream and oranges. 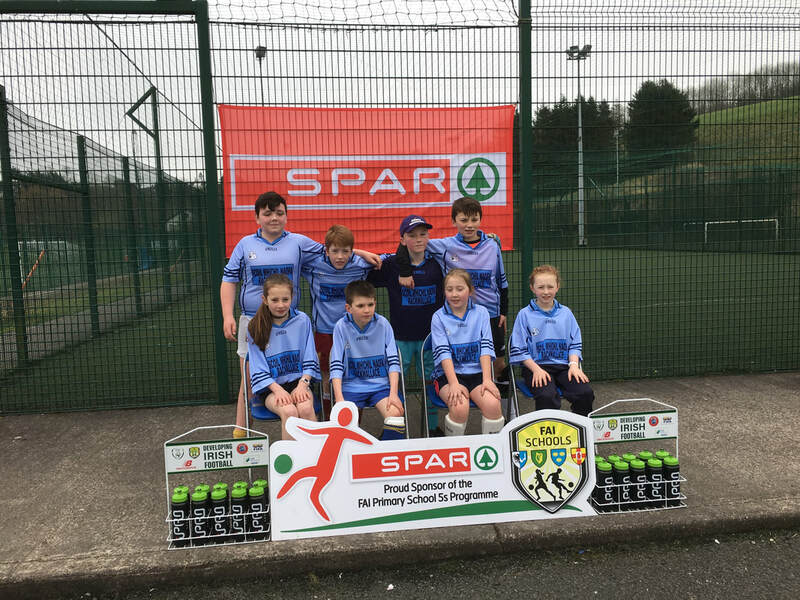 ​It was great to see the boys and girls in the class playing on the same team. The Senior Class had a second visit from Dave Swift, the noted historian. He had told us about the Battle of Clontibret and the Vikings when he came in October but this time he was here to discuss the events of 1916. Dave brought lots of very interesting artefacts with him and very kindly allowed the pupils to pass them around and look at them. He had lots of very interesting stories about the rising and lots of tales about the men and women who fought in Dublin 102 years ago. Highlights of his artefacts included a rifle which was smuggled into Howth in 1914, a gas mask from the first world war and a pistol of the type that was worn by the officers leading the rising. Our pupils were joined by the pupils of Garron N.S. and it was a pleasure to meet pupils from a school the same size as ourselves. The visit was funded by our PTA and we are all extremely grateful to them. Lena Shaw visited us again on Tuesday 6th March. She looked at our 'Sweet Scentsation' and thought they were well made and that we would be able to sell them. We had to chat for a long time about the strengths and challenges to our business idea then we had to begin to draw up a business plan. We began by finding out how much it costs us to make each 'Sweet Scentsation' then we had to try to come up with ideas for selling them. We have set ourselves a target of 100 sales before June. and remember 'Sweet Scentsation will rock your nation'! 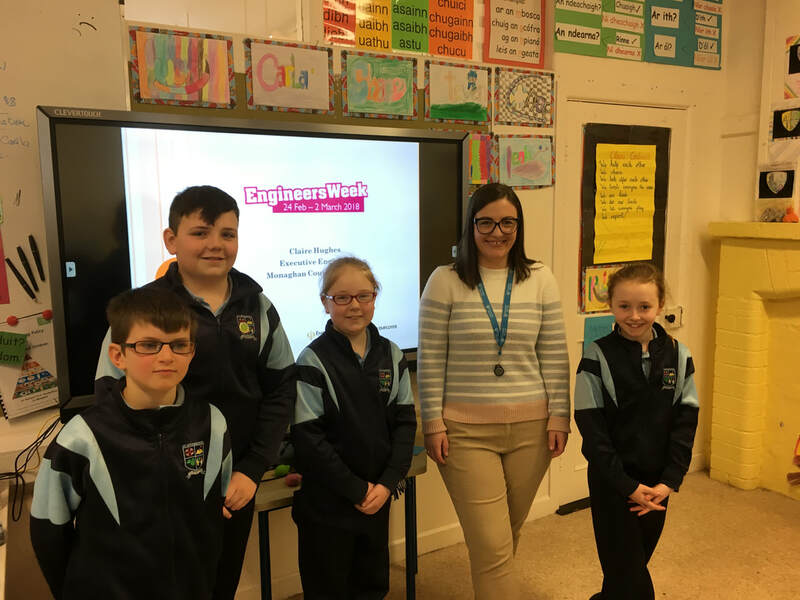 Claire Hughes from Monaghan County Council came to visit our class. She was here as part of engineers' week. She was really interesting and told us about her work and about the work engineers do. She told us we should have to study Maths and English if we wanted to be engineers. Some of us think we might like to do engineering when we're older. She was here as part of 'Engineers' Week'. We have being doing different things all week. We built bridges and tall buildings out of paper and even programmed a human robot! We had our second visit today from Lena Shaw. She works with the Monaghan Enterprise Board. We all had to try and think of something that annoyed us that we thought we could fix with the right product. After a lot of discussion and voting we came up with perfumed stress balls. These will be stress balls that release a calming fragrance when squeezed. We have to make 40 of them by 6th of March when Lena will come again and help us to price them. The plan is that we go to an exhibition in June and we will show our stress balls and other schools will show their products. ​Now all we have to do is 1.) Find a name for our stress balls, 2.) figure out how to make them. 3.) sell a lot of them.